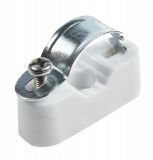 Cable clamp, Ф7mm Plastic cable clamp with a diameter of ф 7 mm. List Price 0.06лв. VAT Incl. 0.05лв. VAT Incl. Cable clamp, Ф12mm Plastic cable clamp with diameter 12 mm. Cable tie flexible holder FMB4APT-I-PA66HS-BK, 28x28mm, black, adhesive, 151-01527 Flexible cable ties mount from HellermannTyton which can be used for routing, grouping and attaching cables, pipes and hoses. Cable ties holder with manufacturer code 151-01527. Cable tie holder TY8G1S-PA66W-BK, 32x25mm, black, self-adhesive Flexible cable ties holder that can be used for routing, grouping and attaching cables, pipes and hoses. Cable ties with manufacturer code 151-11819. Cable tie holder QM40A-PA66-BK, 40x40mm, black, self-adhesive Flexible cable ties mount that can be used for routing, grouping and attaching cables, pipes and hoses. Cable ties holder with manufacturer code 151-10916. 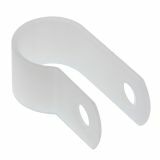 Cable tie holder QM40A-PA66-NA, 40x40mm, white, self-adhesive Flexible cable ties mount that can be used for routing, grouping and attaching cables, pipes and hoses. Cable ties holder with manufacturer code 151-10906. 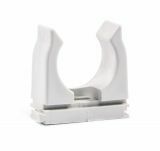 Cable tie holder QM20A-PA66-NA, 20x20mm, white, self-adhesive Flexible cable tie mount that can be used for routing, grouping and attaching cables, pipes and hoses. Cable ties mount with manufacturer code 151-10904. Cable tie holder QM30A-PA66-BK, 30x30mm, black, adhesive Flexible cable tie mount that can be used for routing, grouping and attaching cables, pipes and hoses. Cable ties mount with manufacturer code 151-10915. Eclip Cable clamp ф25mm Eclip Cable clamp. Eclip Cable clamp ф16mm Eclip Cable clamp. Ecav Cable clamp ф25-ф32mm Ecav Cable clamp. Ecav Cable clamp ф20-ф25mm Ecav Cable clamp. Ecav Cable clamp ф12-ф16 Ecav Cable clamp. Ecav Cable clamp ф8-ф12mm Ecav Cable clamp. Ecav Cable clamp ф4-ф8mm Ecav Cable clamp. Cable Clips, KK4-PA66-BK, Ф8mm Plastic cable clips with diameter 8 mm. Cable Clips, Ф13.2mm Plastic cable clips with diameter 13.2 mm. List Price 0.15лв. VAT Incl. 0.14лв. VAT Incl. Cable Clips, Ф8.4mm Plastic cable clips with diameter 8.4 mm.